Meetings are usually held on the 2nd and 4th Mondays at 10.30 am in the Market Theatre Foyer. We play for pleasure music from the medieval to the modern. We have an ever-changing repertoire and are experimenting with different styles. 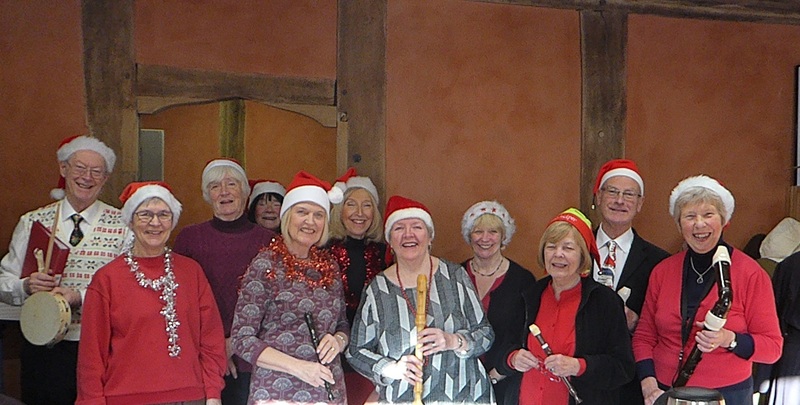 We had played our Christmas concert in the Master’s House in December and were invited back there on March 7th, to play for the Ledbury Amateur Dramatic Society production of ‘A Night Of Fine Die-ning’, A Murder Mystery set in the late 16th century. Seven of us supplied the background music for the feast and subsequent performance. We are now practising for our next ‘gig’, which will be on Community Day June 8th in the town. We can welcome experienced players at any stage but beginners should contact one of the leaders to discuss possibly joining in.